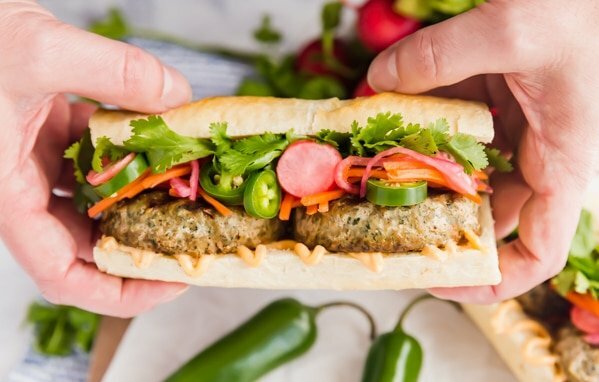 This easy Banh Mi Sandwich is a tasty twist on the traditional Vietnamese specialty. It’s super easy to make and is a totally satisfying sandwich you’ll want to make again and again! 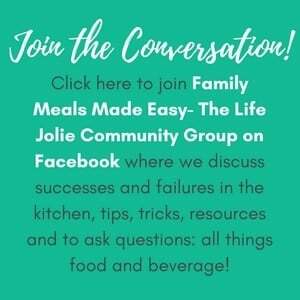 This is a sponsored conversation on behalf of Honeysuckle White and Shady Brook Farms. Thank you for supporting the brands that support this blog. This post contains Affiliate Links. Please see the disclaimer here. Did you guys make a resolution for this year? I typically fail at New Years resolutions, so this year, instead of making one that I know I won’t keep, I’ve resolved to simply try to make better food choices while still enjoying treats in moderation. 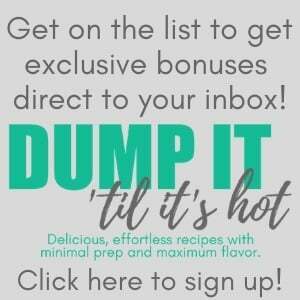 A little 80/20 if you will; 80% balanced foods that more nutritious, a rainbow of fruits and veggies and all-around good food and 20% of the processed and “naughty” stuff. I’ve definitely slipped up a bit but I’m taking it a day at a time. 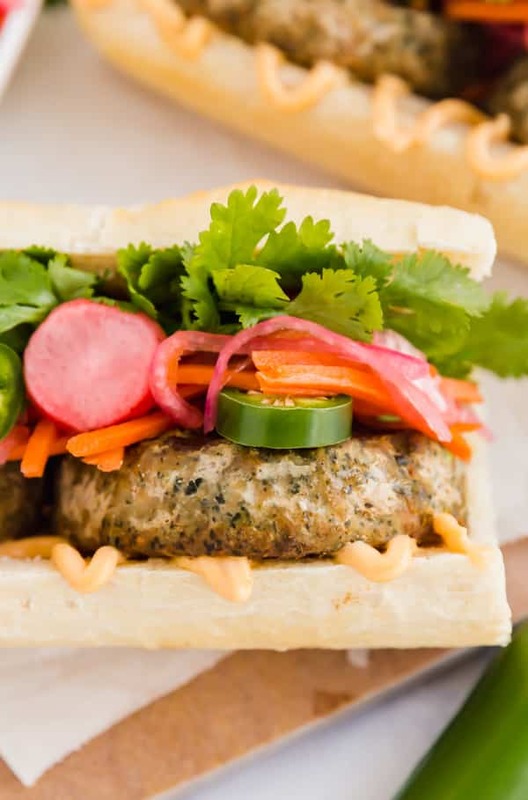 So it seemed like a good time to share a recipe that’s got that same balance involved: this super simple and totally delicious Banh Mi Sandwich. 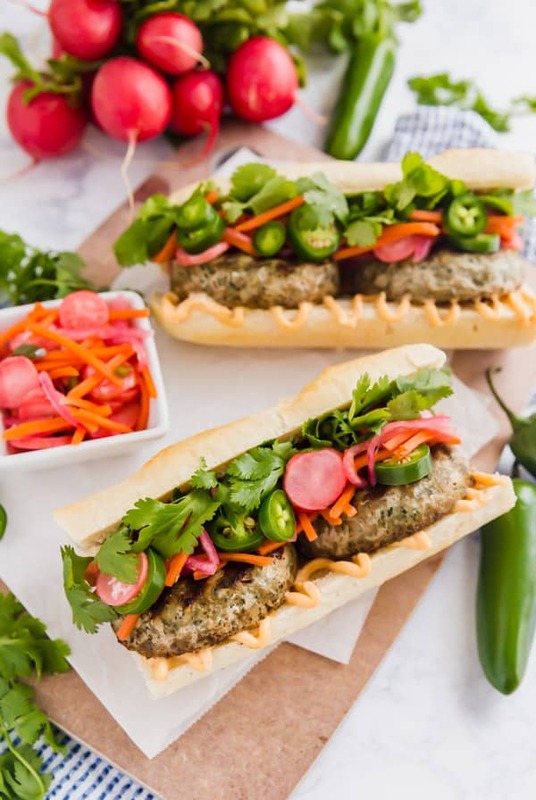 It’s my own tasty twist on a Vietnamese Banh Mi with great flavor from the pickled veggies, fresh cilantro, jalapeño peppers and creamy Sriracha mayo. And the protein that pulls it all together is Shady Brook Farms Spinach & Kale Turkey Patties. These delicious and nutritious patties are the perfect centerpiece to this sandwich. 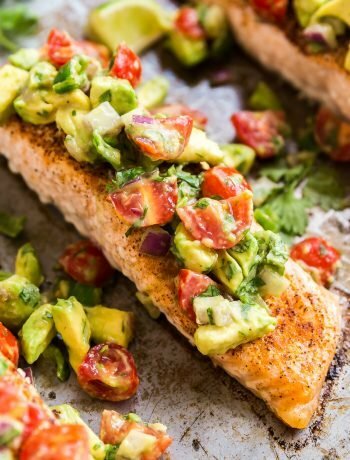 They’re my new favorite go-to protein that allows me to enjoy a satisfying and nutritious lunch or dinner that’s also super easy to throw together! Shady Brook Farms Turkey products are an excellent way to stay on track with your New Years Resolution. 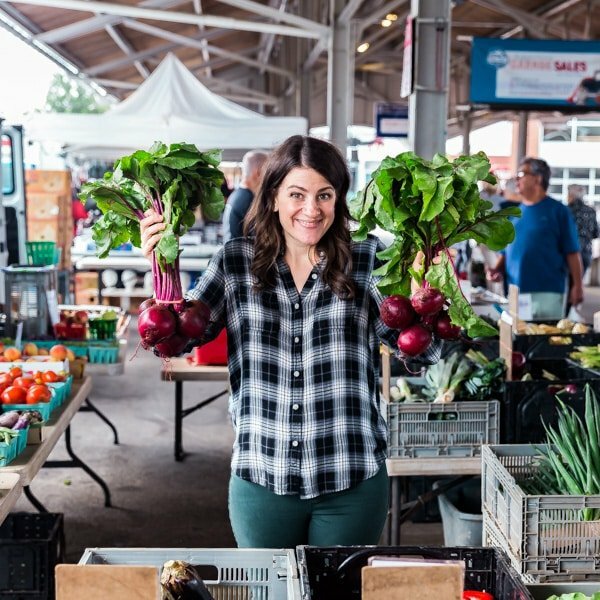 They’re committed to food transparency and helping to put delicious, nutritious food on the family table while also helping you understand where your food comes from and how it’s produced. As I mentioned in my roast turkey post, Shady Brook Farms and sister brand Honeysuckle White are the only major turkey brands to exclusively provide family farm-raised turkeys, which makes me feel good about serving these products to my family and friends. All of their turkeys are raised without growth-promoting antibiotics and no added hormones or steroids. You can find Shady Brook Farms products at retailers on the East Coast, while Honeysuckle White products are available at retailers in the Midwest / West Coast. They offer a variety of tasty products that can help you stick to your goals, including Ground Turkey, Cheese Stuffed Italian Meatballs, HomeStyle Turkey Meatloaf and Turkey Breast Strips. 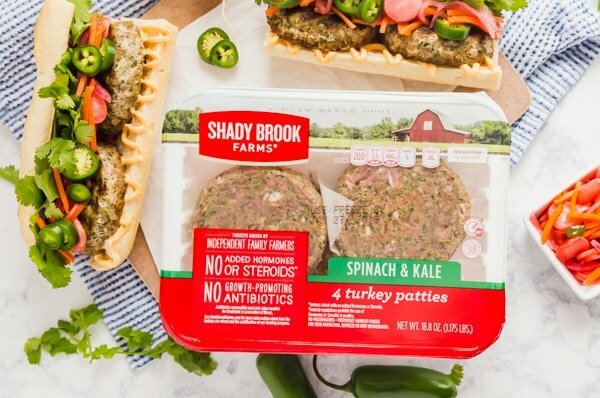 Click here to find the Shady Brook Farms Spinach & Kale Turkey Patties that are featured in this recipe at a retailer near you! I like to prepare the pickled vegetables in advance, usually the night before. They can also be prepared the day-of, but they do require at least a couple hours to marinate. I like to slice my radishes, carrots and onions to be very thin. A Mandoline works great for this and you can usually find the carrots pre-shredded. If you don’t want the pickled veggies to be as spicy, removed the pepper seeds before chopping and adding to the mixture. My favorite way to cook the Shady Brook Farms Spinach & Kale Turkey Patties is to grill them, either outside on our grill or on the stovetop using a grill pan . Be sure to cook the patties until they reach an internal temperature of 165 degrees, which is considered the safe temperature for consuming poultry. I insert an Instant Read Thermometer into the thickest part of the pattie for the most accurate results (and the juices will also run clear). When cooking on the stovetop, if you find that the patties haven’t reached 165 degrees, you can add a small splash of water to the bottom of the pan and cover it for a couple minutes to lightly steam until it reaches the right temperature for consumption. You can usually find Sriracha mayo in the grocery store near the other prepared mayonnaise products but you can also make your own by adding Sriracha sauce to mayonnaise and tasting it until you have the flavor balance that you want (start with a little and add more). 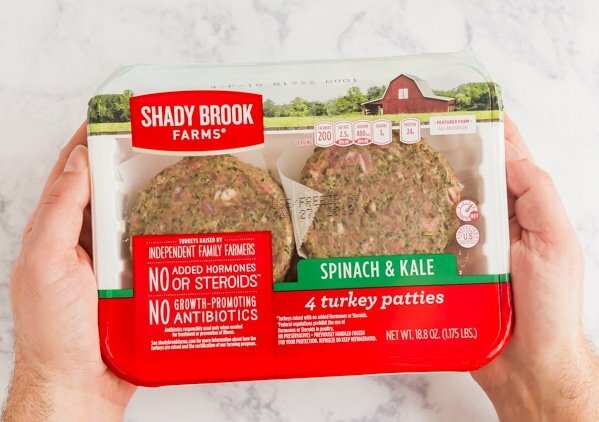 Can I freeze the Shady Brook Farms Spinach & Kale Turkey Patties? Yes! They freeze very well wrapped in plastic wrap and bagged in a zipper freezer bag. What if I don’t like spicy foods? No problem! Remove the seeds from the pepper used in the pickled veggies or omit it entirely (this includes the sliced jalapeño peppers) and substitute with plain mayo (or make your own Sriracha mayo with a smaller amount of Sriracha). What is a traditional banh mi? 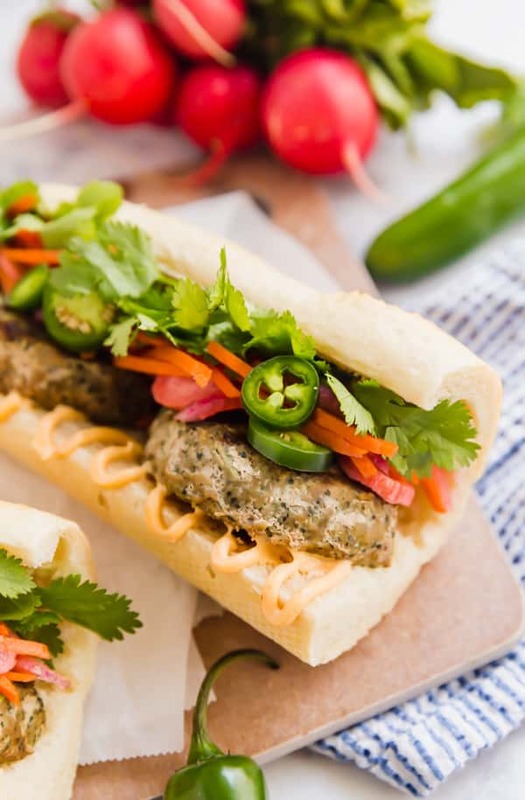 A Banh Mi is Vietnamese street food that a hybrid of a Vietnamese and French sandwich. Usually served on a baguette with pickled vegetables, cilantro, chilis and cucumber featuring various protein options. Is this an authentic Banh Mi? Probably not. 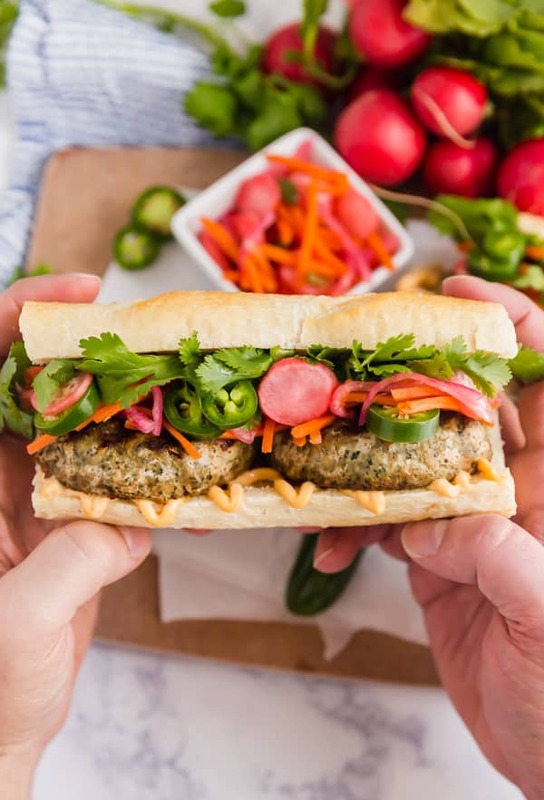 While it’s inspired by a traditional Banh Mi, I’ve added my own twist to this sandwich and while it’s may not be traditional, it sure is delicious! Can Banh Mi be eaten cold? Yes, but this sandwich is best served just after the patties are cooked. 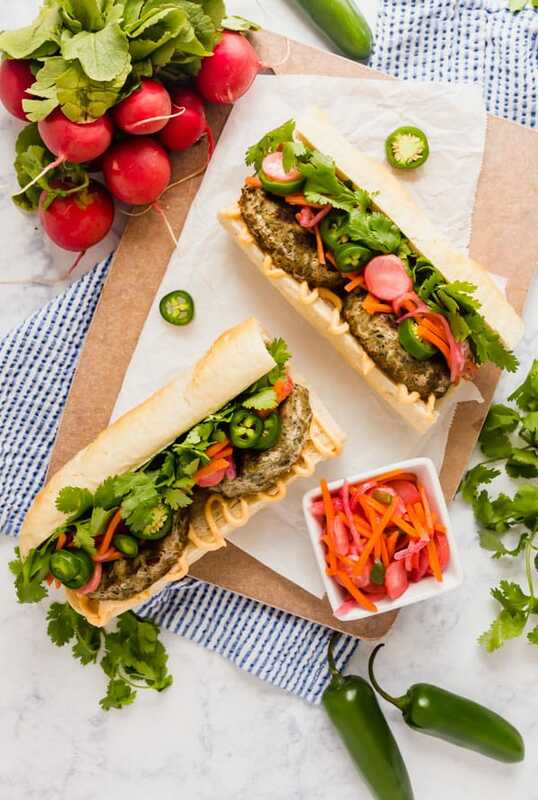 This easy Banh Mi Sandwich is a tasty twist on the traditional Vietnamese specialty. It's super easy to make and is a super satisfying sandwich you'll want to make again and again! While the vinegars heat up, place radishes, carrots, onion and jalapeno pepper into a large bowl. Sprinkle with sugar and salt and toss to combine. Pour the warm vinegars over the vegetables and stir until all components are well combined. Cover and refrigerate for at least 4 hours, or overnight. Spray a grill pan (or your grill) with cooking spray and heat over medium high heat. 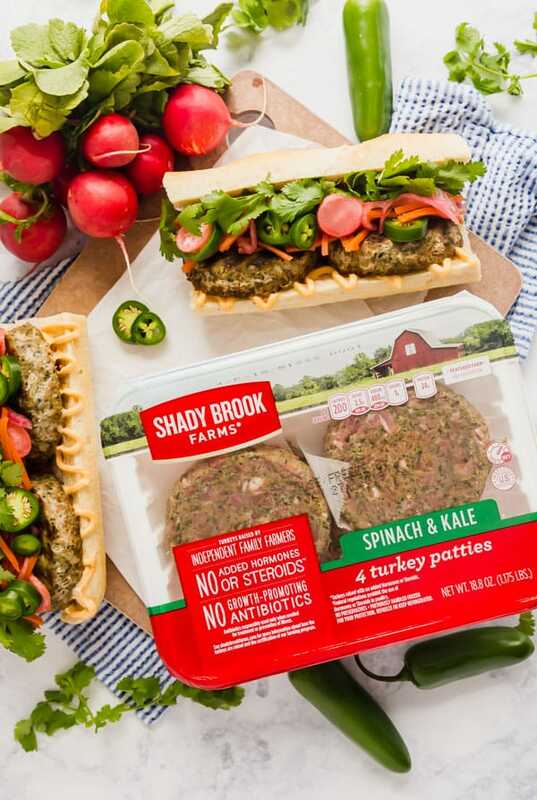 Once it's nice and hot add Shady Brook Farms Spinach & Kale Turkey Patties. Cook for 6-7 minutes per side turning once and check temperature. If it hasn't reached 165 degrees keep cooking (if using a grill pan, add a small splash of water to steam for a couple minutes until it reaches temp). Remove from heat and rest for 3-5 minutes. Slice in half. While the Shady Brook Farms Spinach & Kale Turkey Patties cook, Slice the baguette so you have a top and a bottom. Drizzle a generous portion of Sriracha mayonnaise onto the bottom bun. Place the pattie halves onto the bottom bun in a single layer. Top with plenty of pickled vegetables, additional sliced jalapenos if you like spicy foods, fresh cilantro and the top bun. Serve immediately. Looking for some other great sandwich recipes?